Today almost all hosting providers offer you to appreciate 99.99% uptime. However, you should know that it has nothing to do with reality. 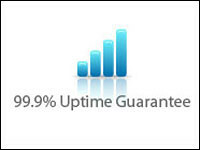 Usually, such incredible 100% uptime guarantee is offered by hosts with cheap hosting plans. No one admits that their hosting plan is not so great due to the great competitiveness on the market. No one except reliable web hosting companies with a good reputation who needs no extra advertisement. Usually, such trustworthy companies offer you 99.5% uptime. So, why uptime is so important for your project. This mysterious figures stand for the time throughout the month when the server is able to process all traffic request. For example, when you look for some site and it doesn’t respond, it means that server is down – partially or totally. It leads to traffic loss that makes your online business not so advantageous. What is more, stable server time as well as high speed network also influence your SEO ranking. Thus, to find a reliable host with decent uptime is a must. With promising options offered by most web hosting companies we can make a conclusion that there are no guaranteed uptime you can be sure about. As you can see in the picture below, the sites are down and quite often. There are several different sites displayed that are hosted with different hosting companies. Some of these web sites are new, some of them are hosted with UK hosting. The figures vary but not greatly. All in all, downtime is a usual thing for them. 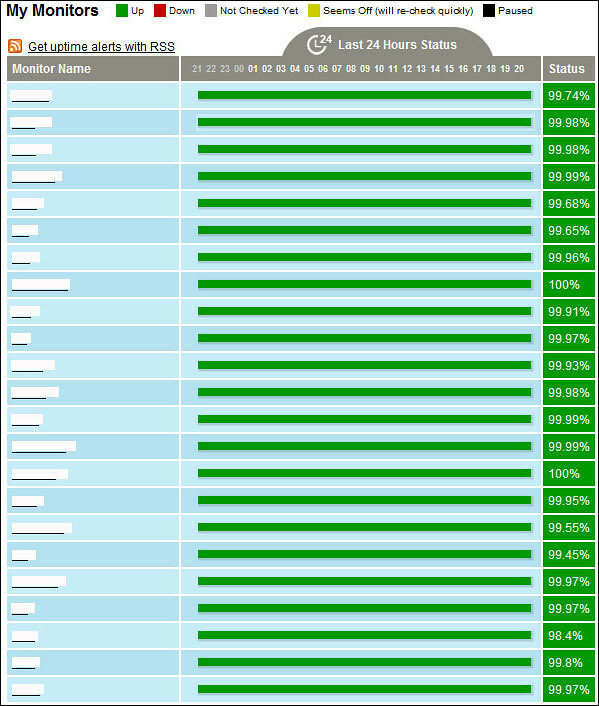 According to our experience and research, the uptime you can rely on is mostly provided by UK host. Maybe because these hosts are not so overloaded with plenty of web sites. Maybe because we have chosen the best UK web hosting company that really provides us with great service. You also can check whether your web host providing the true uptime it guarantees you. There are quite a lot of host trackers in the Internet. Use them to find out more about the servers you want to trust your business. Note that sometimes some servers can’t be seen from some countries or just available to check in the country of hosting company location. In this case, host tracker also helps you a lot. Of course, uptime is one of the most important features you should look for when choosing web hosting. However, almost all web hosts offer you 99% uptime. In this case, the other features provided as well as the reputation of the web hosting company should influence your choice. Anyway, we also offer you to pay attention to the words reading so promising hosting plans. For example, web hosting provider can confuse you with Network Uptime and Server Uptime. You see the word uptime, the figures 99.99% and nothing else matters. Actually, you need server uptime that is more important for you. Server uptime means that every server will remain up for the time your host claims. While network uptime stands for the fact that the whole network (Lan, Wan) will be up even if one of the host’s servers is down. Feel the difference and don’t buy that idea of ideal uptime hosting plans.